reducing and/or removing greenhouse gases emissions, where possible. The purpose of the sourcebook* is to further elaborate the concept of CSA and demonstrate its potential, as well as limitations. It aims to help decision makers at a number of levels (including political administrators and natural resource managers) to understand the different options that are available for planning, policies and investments and the practices that are suitable for making different agricultural sectors, landscapes and food systems more climate-smart. This sourcebook is a reference tool for planners, practitioners and policy mak- ers working in agriculture, forestry and fisheries at national and subnational levels. The sourcebook indicates some of the necessary ingredients required to achieve a climate-smart approach to the agricultural sectors, including existing options and barriers. First published in 2013, the CSA Sourcebook has undergone a complete revision for the launch of this new digital platform as the Second Edition, 2017 - where any section or module can be updated to reflect new scientific insights, case studies or policy developments and links are provided to relevant external resources. *Download the full first edition of the sourcebook from the right-hand column. Agriculture and food systems must undergo significant transformations in order to meet the related challenges of food security and climate change. Increasing resource efficiency is essential both to increase and ensure food security on the long term and to contribute to mitigate climate change. Addressing food security and climate change requires concerted and coordinated involvement and action of all stakeholders on a long term perspective. Climate smart agriculture is not a new agricultural system, nor a set of practices. It is a new approach, a way to guide the needed changes of agricultural systems, given the necessity to jointly address food security and climate change. Managing agriculture, forestry and fisheries at a landscape scale is key to achieving sustainable development. Appropriate land-use planning and decision making at the landscape level should be based on a participatory, consensus-based and people-centred approach. Production sectors are often managed in isolation from each other, and this can be counterproductive. Coordination at the landscape level facilitates the integrated management of production systems and the natural resources that underpin ecosystem services needed for all sectors. Climate-smart agriculture, which follows a landscape approach, can address the challenges involved in intersectoral natural resources management. Measuring and monitoring the multiple benefits of climate-smart landscapes is essential for tracking the impact of intersectoral efforts. Most of the impacts of climate change on agriculture are expected to result from changes in the water cycle. Because of this, the design of climate-smart agriculture (CSA) strategies will need to be viewed through a ‘water lens’. Climate change will affect both rainfed and irrigated agriculture through increased crop evapotranspiration, changes in the amount of rainfall, and variations in river runoff and groundwater recharge. The impact of climate change on water use in agriculture must be considered within a wider context in which a number of issues are taken into account including: increased water demand by all sectors; the degradation of water quality; and heightened competition for water at various levels (community, river basin and aquifer). Knowing the status and condition of soils and their properties is fundamental for making decisions about sustainable soil management practices that contribute to climate-smart land use. Soils that have been degraded are at much greater risk from the damaging impacts of climate change. Degraded soils are vulnerable due to serious losses of soil organic matter (SOM) and soil biodiversity, greater soil compaction and increased rates of soil erosion and landslides. In addition, land degradation is itself a major cause of climate change. Management practices that increase soil organic carbon (SOC) content through organic matter management rather than depleting it will bring win-win benefits. These practices will maintain productive soils that are rich in carbon, require fewer chemical inputs and sustain vital ecosystem functions, such as the hydrological and nutrient cycles. In light of increasing and volatile fossil fuel prices, the dependence of agrifood systems on fossil fuels represents a major threat to food security and contributes significantly to climate change. The challenge of reducing this dependency on fossil fuels can be met by upscaling of energy-smart food systems. These systems improve energy efficiency, increase the use and production of renewable energy, and broaden access to modern energy services in agrifood systems. In developing countries, increased access to modern energy services in agrifood systems is often required to improve productivity and income, and advance economic and social development. However, an increase in energy consumption, even if based initially on fossil fuels, may result in lower absolute GHG emissions. Genetic resources for food and agriculture are the basis for sustainable agriculture and food security. They are essential elements for increasing the efficiency and resilience of food systems. Genetic resources are the raw materials that farmers, breeders and researchers rely upon to improve the quality and the amount of food produced, and to respond to new conditions, including changes in climate. The conservation and sustainable use of genetic resources provide important options for adapting agricultural production to the impacts of climate change. Consequently, any loss of genetic diversity is a threat to the well-being of present and future generations. To cope with the challenges of climate change, crop production must adapt (e.g. crop varietal selection, plant breeding, cropping patterns and ecosystem management approaches) and become resilient to changes (frequency and intensity). Farmers are the primary custodians of knowledge about their environment, agro-ecosystems, crops and cropping patterns, and local climatic patterns. Adapting cropping practices and approaches will be related to local farmers’ knowledge, requirements and priorities. Sustainable crop production provides farmers with options for farming sustainably, taking into account the local ecosystem. Integrated approaches—such as crop-livestock systems, rice-fish systems and agroforestry—diversify food sources and consequently strengthen the resilience of farmers’ livelihoods. They also provide opportunities for mitigating climate change. Livestock’s role in adaptation practices relates primarily to the management of organic matter and nutrients, and the diversification of incomes. Several CSA practices are readily available for implementation. Including practices such as grassland restoration and management (e.g. sylvopastoral systems), manure management (e.g. recycling and biodigestion) and crop-livestock integration. Barriers to adoption are most often related to a lack of information, limited access to technology and insufficient capital. Overcoming these barriers requires specific policy interventions, including extension work and financing mechanisms, such schemes for improving access to credit and payment for environmental services. Climate change and climate variability jeopardize the delivery of goods and ecosystem services from forests and trees that are essential to livelihoods and food security, to environmental sustainability, and to national development. Sustainable forest management (SFM) provides a fundamental foundation for climate change mitigation and adaptation and contributes to food security through various means. Climate-smart forestry will require more widespread application of SFM principles. Mainstreaming climate change into forest policy and practice will entail capturing synergies and managing tradeoffs with other forest management objectives. Forests and trees provide a range of forest products and ecosystem services. The benefits and costs of these will accrue differently to different stakeholders, as will the benefits’ costs and benefits associated with mitigation and adaptation actions. The costs and benefits associated with mitigation and adaptation actions must be equitably shared to secure long-term commitment to their implementation. Fisheries and aquaculture provide essential nutrition, support livelihoods and contribute to national development. However, the sector is facing significant challenges in maintaining its crucial contribution to these areas. Increasing global demand for fish and aquatic foods, ocean acidification and climate variability and change will only add to these challenges. gaining an understanding of the ways to reduce effectively the vulnerability of those most likely to be negatively impacted by climate change. The application of the sustainable and inclusive food value chain approach directly links to CSA and can help to improve performance along the value chain from input supply, to food production, to post-harvest handling and storage, processing, distribution, marketing and retail, consumption and disposal patterns of waste. Consumers’ awareness should be raised regarding reduction, reuse and recycling of foodstuffs that are still fit for human or animal consumption or other purposes, including waste as compost or to generate energy from, for example, biogas. Public support and investment, as well as public-private partnerships, are needed to ensure that sustainable technologies and practices are adopted. This may be necessary because, for example, green technologies may not be profitable in the short term, but socially and environmentally beneficial. 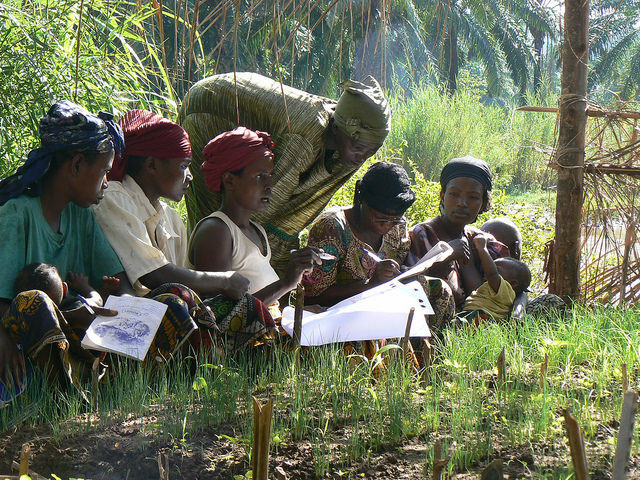 To enable smallholders to make the transition to CSA, strong institutional support is required to improve the dissemination of information, provide financial support and access to markets, and coordinate the work of a large number of farmers over a wide area. The needs, priorities and drivers of individual institutions must be understood and managed suitably to successfully establish the needed CSA collaborations. Institutional synergies and networks for knowledge exchange are key to establishing, maintaining and scaling up CSA initiatives. CSA needs to be mainstreamed into core government policies and programmes, including policy, expenditure and planning frameworks. Priority needs to be given to CSA practices that bring productivity gains, enhance resilience and reduce emissions. CSA and CSA policies must contribute to broader economic growth, poverty reduction and sustainable development goals. They should also provide an enabling environment for the adoption of CSA by the private and public sectors. CSA requires coordination, between concerned agencies across different sectors at central and local levels. Partnerships with non-state stakeholders play a key role in CSA. A wider landscape approach is needed for the better management of agricultural production and ecosystem services. An integrated approach to providing incentives for CSA, such as payments for environmental services, is needed. Public support that focus on research, the development of human capital, the sustainable management of soil and land, social protection and safety nets, and the development of technology and value chains are conducive to CSA adoption. Current agricultural investment flows are insufficient to adequately finance sustainable agricultural development. This financing deficit is due not only to a lack of overall funds, but also to the fact that the activities that are currently allocated resources do not generate the highest returns for sustainable agricultural growth. The main sources of agricultural investment finance are the farmers, herders, fishers and foresters themselves. For this reason, public investment that enables agricultural producers to make investments in CSA is a priority. Proven DRR technologies and practice provide a rich resource base for promoting and scaling up CSA. At national and regional levels, well-established legislation, institutional structures, policies and plans for DRR can provide CSA with a strong supportive enabling environment. For farmers, there is no distinction between risk reduction and adaptation. From their perspective, there are only threats to livelihoods and family food security from which they need to be protected; improved feeding and reduced losses from disease in aquaculture; the reduction of post-harvest and production losses; and the further development of regional trade. Growing climate-related risks result in greater protection needs for the most vulnerable from shocks and stresses. The poorest and most food insecure households and communities are risk avert and face significant barriers to adopting livelihood strategies that would allow them to enhance their food and nutrition security in the face of increased climate risks. Resource transfers provided through safety nets ensure access to food and protect lives, livelihoods and potential development gains in CSA. Making agricultural production and management systems climate-smart is a knowledge-intensive process requiring a comprehensive capacity development approach of all stakeholders that builds on sound assessments of country needs across the individual level, organizational level and the enabling environment. Due to the uncertain and dynamic nature of climate change impacts, a transition towards climate-smart agriculture requires socio-institutional learning processes with a strategic approach to skills development for climate-smart agriculture at country level including strong engagement of national and local formal and informal education and training institutions. In order to improve policy coherence and effectiveness, strengthen local institutions and mainstream CSA into national policies and programmes, it is important to create inclusive, gender sensitive spaces that promote multi-stakeholder dialogue about CSA, such as cross-ministerial roundtables, multi-stakeholder platforms for strategy development and efforts to coordinate regional bodies. Assessment, monitoring and evaluation are crucial for learning and for conducting policy reviews. The past and future impacts of climate change on agriculture and the vulnerability of livelihoods need to be assessed. CSA options should be assessed for their effectiveness in achieving goals related to climate change adaptation and mitigation, food security and development. Monitoring and evaluation activities set baselines, define indicators, measure progress and evaluate successes and setbacks in CSA interventions. FAO, 2013. Climate-Smart Agriculture Sourcebook.